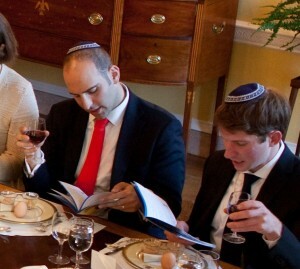 The Passover Seder is one of the most commonly-observed Jewish practices, passed from generation to generation for millenia. The Seder engages every participant from the youngest to eldest, by following carefully prescribed rituals that invite questions and an active discussion. 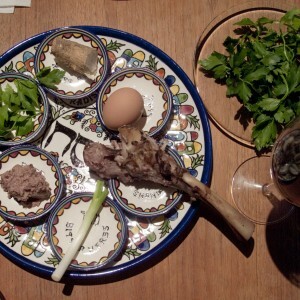 The very word Seder means order — everything has its place on an organized list. 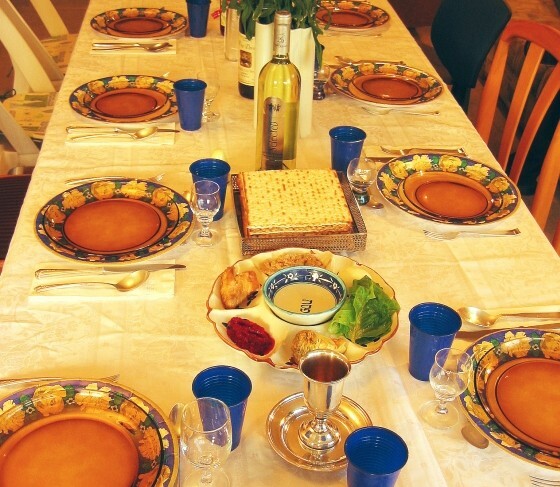 On this page you will find a brief description of each step through the traditional Passover Seder. 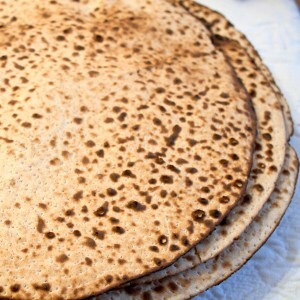 Enough Matzah for each participant to have at least the volume of 2.5 eggs, including three unbroken Matzos. Enough Maror and/or Chazeres for each participant to have at least the volume of 1 egg. While many people think immediately of horseradish, romaine lettuce is considered ideal for Maror as it is sweet initially and turns bitter over time — analogous to the way Pharoah sweetly enticed the Jews to begin working, and then made their lives bitter. 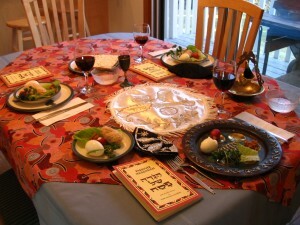 A Passover Haggadah for each participant. If you use a traditional Haggadah, you don’t need to have the same one for each person as the Hebrew text will be the same, and the translations will be similar. So you can mix, match, and compare. The items for the Seder plate. Food! Lots, and lots, of food, without the least trace of leavened grains. Beitzah – a roasted egg. This is in place of the second sacrifice. We use an egg, symbolic of mourning, to remind us that the Temple is destroyed and we hope that it shall be rebuilt soon. 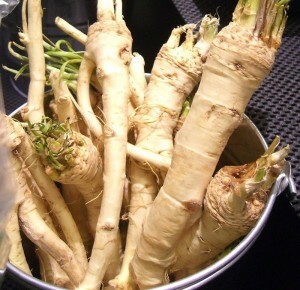 Maror and Chazeres – types of bitter herbs, reminding us of the bitter slavery in Egypt. 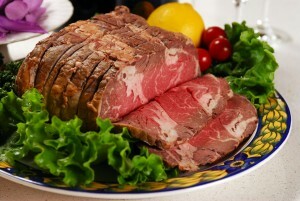 It is common to use romaine lettuce as Chazeres and horseradish as Maror. 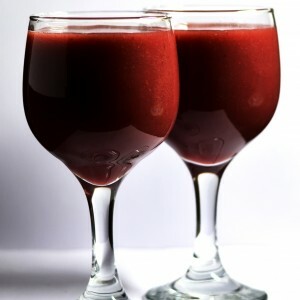 Charoses – a mixture of grated apples, nuts, other fruit, cinnamon and spices, mixed with red wine. It looks like mortar, to remind us that we were forced to build with mortar as slaves in Egypt. 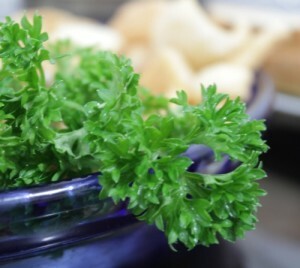 Karpas – a vegetable unsuitable for Maror, to be dipped in salt water and eaten. The Seder begins with the saying of Kiddush, Sanctifying the holy day. In Hebrew, Kiddush is a cognate of Kedushah, holiness. By saying the Kiddush we acknowledge the sanctity of this special day, and thank G-d for bringing us to celebrate this occasion. During the Seder, a total of four cups of wine are consumed. It is customary for each person’s cup to be filled by another participant, as if, symbolically, each person had a servant to pour the wine. We drink the cups reclining on our left side, again symbolizing luxury and majesty. Each participant takes a small piece of vegetable (often potato or parsley), dips it in salt water, says the blessing on produce grown from the earth (as found in the Haggadah), and eats it. By keeping our concentration, we keep our hands clean long enough to eat the vegetable. Therefore we avoid talking (except for the blessing, and anything necessary for eating the vegetable) between washing our hands and eating it. When making the blessing, have in mind the Maror, the bitter herb which will be eaten later. That is also produce grown from the earth, and is not ordinarily eaten by itself (only as a topping or part of a mixture) as part of a meal. Break the middle Matzah into 2 parts. 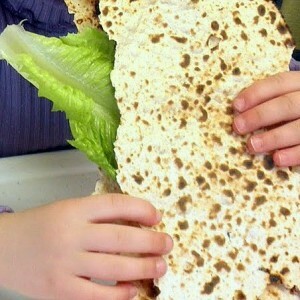 The bigger half is set aside to be used as the Afikoman, the Matzah eaten at the end of the Seder. There are two customs regarding what happens to the Afikoman, both designed to increase excitement and participation by children (of all ages). The first is that the leader puts it in a “safe” place, but the children abscond with it when the leader is looking elsewhere, and they later “ransom” it for a present. The alternative is that the leader hides it while the children are not looking, and they search for it later. This is the core of the Seder; to speak about the Exodus from Egypt. 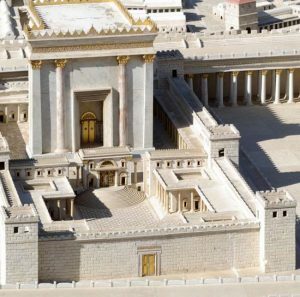 As it says in the Haggadah, each person should see him or herself as having personally experienced the Exodus, and having the duty to pass this knowledge on to the next generation. This is based upon the verse: “You shall tell your son on that day, saying, ‘because of this, what God did for me in my departure from Egypt'” [Exodus 13:8]. 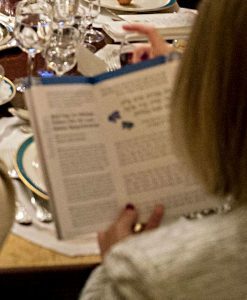 “Tell,” V’Higgad’ta, is a cognate of Haggadah — which means “telling.” The point of the Haggadah is to tell this history and transmit it to each new Jewish generation. So have we done for millenia, from the time of the Exodus itself. We wash our hands before eating the Seder meal. This time we say the blessing, as found in the Haggadah. It is important to not speak from now through Korech, the sandwich of Matzah and Maror, to maintain our focus on keeping our hands clean when eating bread (unleavened, in this case!). The leader of the Seder lifts all three Matzos, and says the blessing for eating bread. 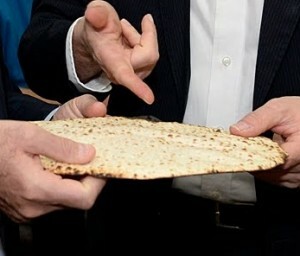 The leader sets down the bottom matzah, keeping the top two, and says a second blessing on the Commandment to eat matzah. This, like Maggid, is a special Commandment which can only be performed on the Seder night, and one should consider this while eating the matzah. Each person receives a small piece of each of the top two matzos, plus additional matzah to make up the volume of an egg. This should be eaten while reclining on the left side. Each person receives an amount of Maror, Bitter Herb, to make up half the volume of an egg. The leader dips Maror in Charoses, shakes off the Charoses and says the blessing on the Commandment to eat the Maror. This blessing also applies to the Maror that is part of Korech, the next step, and one should have this in mind when making or listening to the blessing. The Maror is eaten without reclining. 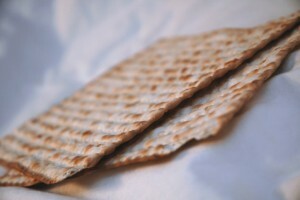 Each person receives a small piece of the bottom Matzah, plus additional Matzah to make up half the volume of an egg, and the same volume of Maror. 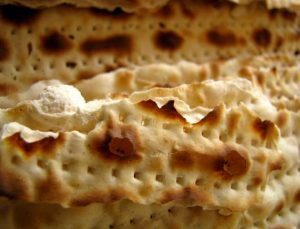 The sandwich of Matzah and Maror is then dipped in Charoses. After recalling how the scholar Hillel would combine these with slices of the Passover sacrifice and eat all three together, we eat the sandwich while reclining. Enjoy the festival meal! Remember, though, that the Commandment to speak about the Exodus continues throughout the night. 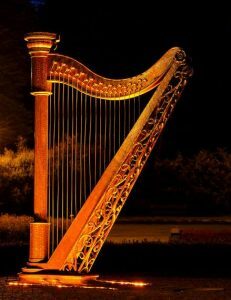 For this reason, it is customary to sing holiday songs, discuss commentaries and speak further about the Exodus, while minimizing idle talk. Keep in mind, also, that the Afikomen should be eaten while one still has an appetite. The Afikoman is found or recovered, and each participant receives a piece from it and additional matzah to make up half the volume of an egg, or the full volume of an egg according to some opinions. This should be eaten all at once, while reclining. After pouring the third cup of wine, we recite Grace after Meals. We then drink the cup, while reclining. 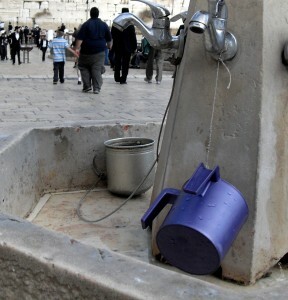 A special cup is poured to welcome Elijah the Prophet, and the front door opened. We recite a paragraph invoking Divine Judgment upon those who have persecuted the Jews throughout history, ever since the Exodus. The fourth and final cup of wine is poured. Some have the custom to distribute Elijah’s cup among the participants as part of this fourth cup. We say or sing the Hallel, Psalms recited on holidays along with additional praises, as we close the Seder. We then say the blessing over wine, drink the fourth cup while reclining, and say the blessing after drinking wine. We recite a paragraph in which we pray for the privilege of performing the full Passover service — next year in Jerusalem. Then we sing several additional songs of praise composed for the holiday, which concludes the Seder. Indeed — next year, in Jerusalem!